Hey all, just wanted to let you know about a giveaway we're having on the facebook page. You and a friend could EACH win a fat eighth bundle of our newest line, Honey Honey! Details on the Facebook page! 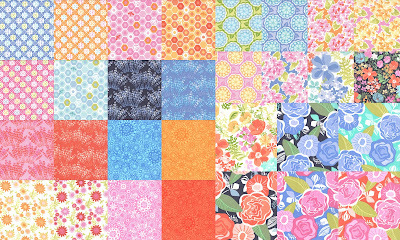 1. do.good blocks- January blocks - finished but no picture (of course) - you can imagine a herringbone block in pink, yellow, magenta and orange though! 6. 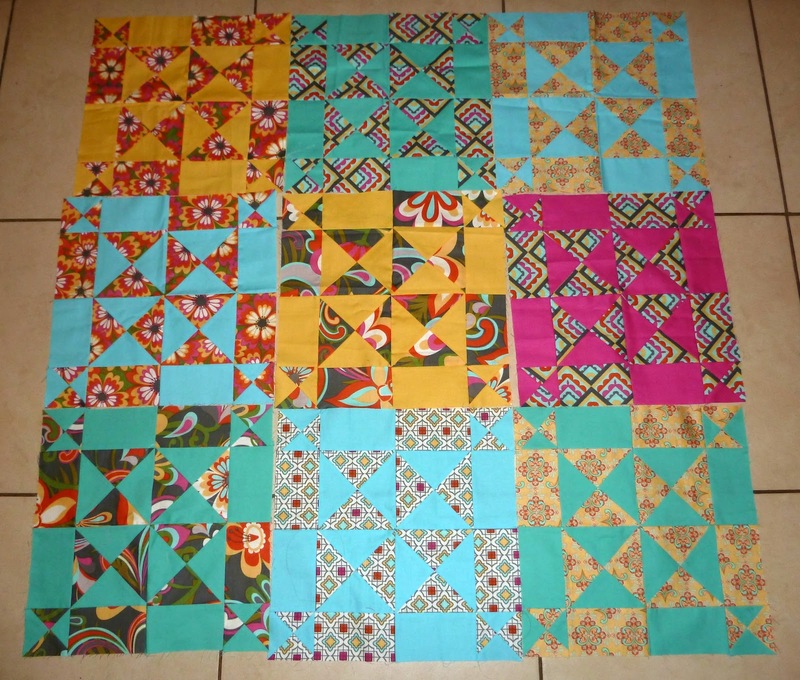 Mod Pop quilt - no progress. 1. 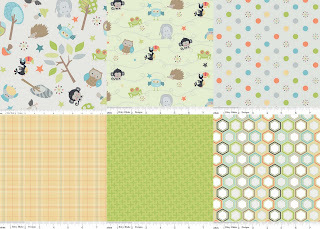 Honey Honey baby quilt - stalled at the quilting stage, needs to be finished by this weekend! be sure to go check everybody else's progress out!! 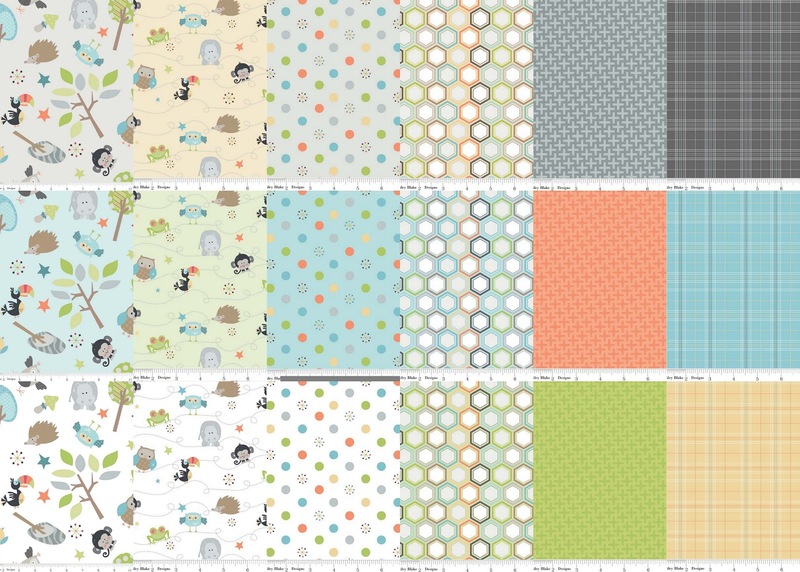 Last week I got an email from my sister's former teacher, asking me to make a baby quilt for her new goddaughter. Of course I accepted immediately, figuring I would have some time to find the perfect design and colors to match her request... then she told me the Christening was February 17th. Okay, no problem I can handle that... except i'm 6,000 miles away and need to give myself a week for shipping.. okay, starting to panic now. Thankfully, Honey Honey arrives last week and it fit what she wanted perfectly! Friday night I cut my materials, sewed my HST's and spent more of the evening trimming a bajillion pieces.. ugh! 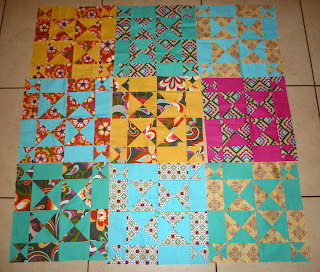 Saturday I pieced all the blocks and basted the quilt... then... roadblock. 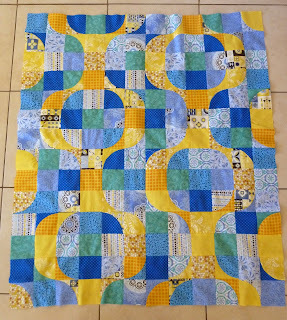 How the heck do I quilt this!? 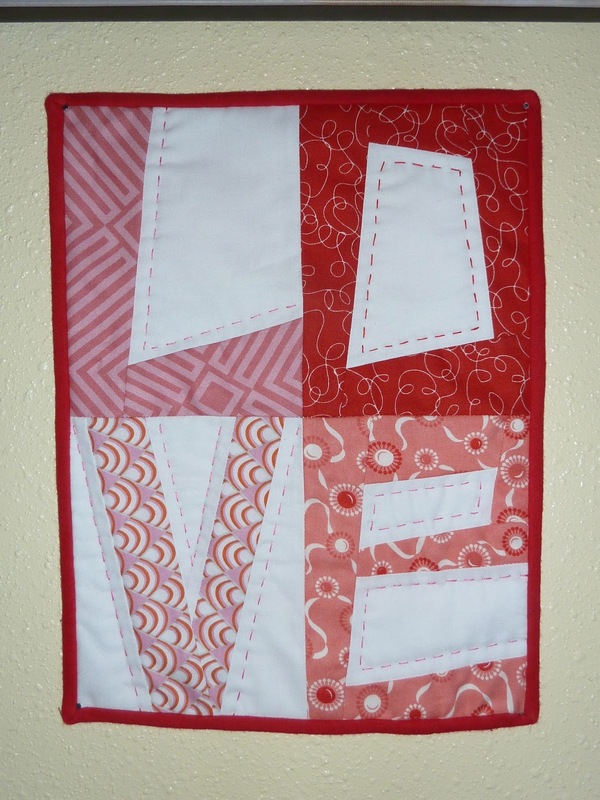 My FMQ skills are sub par and I don't want to mess this up! I can manage some simple stippling but nothing too crazy. I was thinking something like this one but I can't decide! Advice please?! I need to get this quilted this week and in the mail early next week so any and all help is greatly appreciated!!! 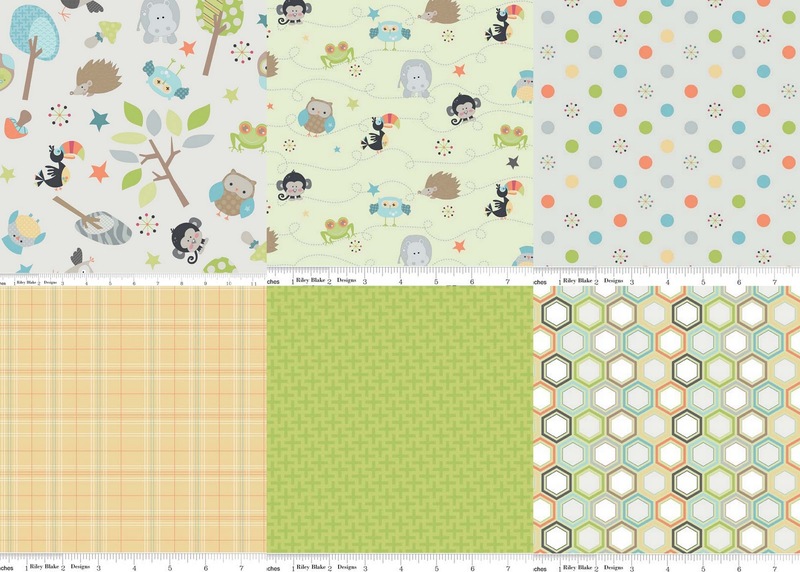 We've got fat quarter and half yard bundles as well as yardage of the line. Be sure to check it out! As a reminder, shipping rates are going up on Sunday, so take advantage before they increase! Well, I think I may have jumpstarted some of my sewing mojo.. it's not quite back in full swing, but I did get some things done this weekend! I've been wanting to try Kelly's tutorial for a long time, so I finally did! I decided to take Friday off after finding out my student was going to be absent (score!) and I utilized my time VERY well... First I finished a quilt top started in 2012, my Simply Color postage stamp quilt. 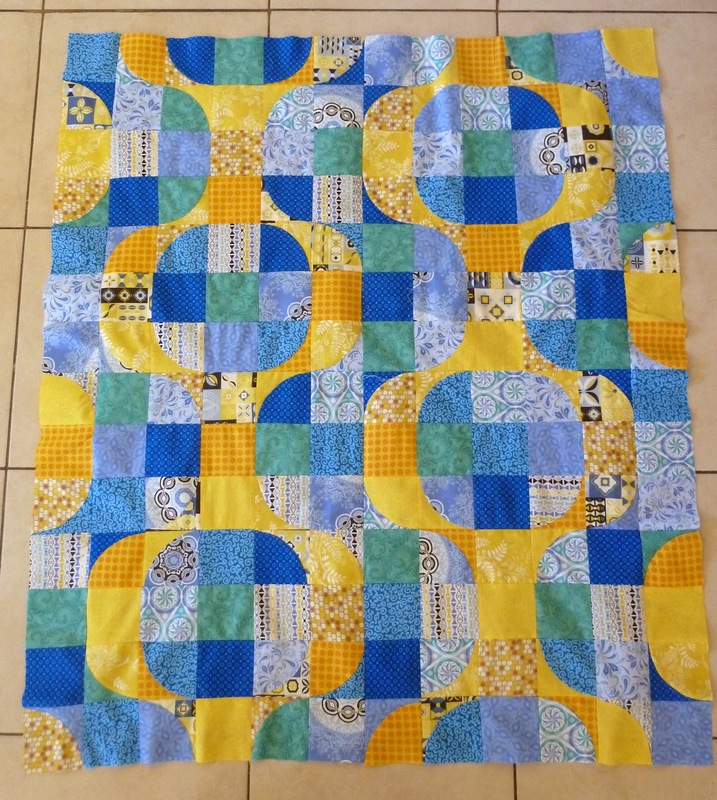 I'm hoping to have the backing done this week and get it basted as well..
Then I also had another 2012 quilt top I was able to finish, a baby pattern i've had on my list for a long time. I've got the backing done on this one, so its waiting to be basted as well..
Well, I've got today off as well for MLK Jr. so i'll be taking advantage and trying to complete some more things on my list. I have a bunch of new projects i'd like to start, but i'm trying to clean up and organize myself a bit first.. we'll see how long I can last. I'm also wayyy behind in my bee blocks so thats top priority.. 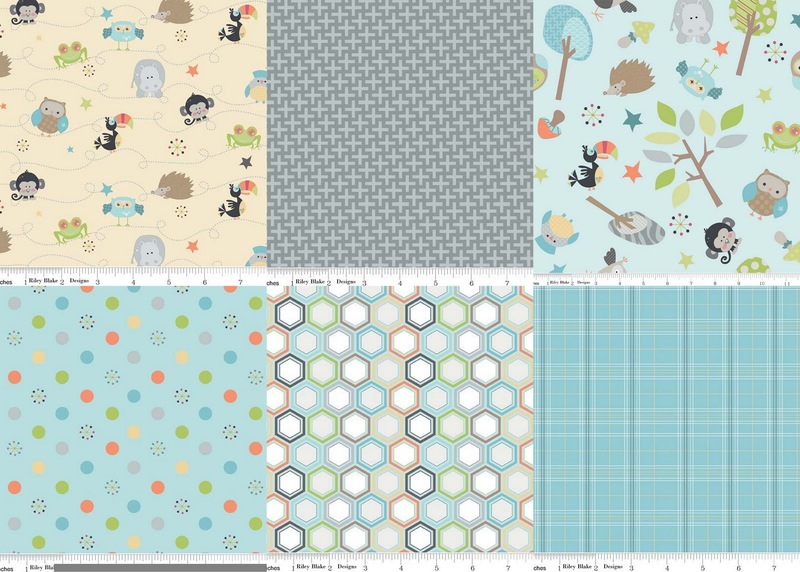 Here's hoping my sewing motivation sticks around for a while! So this past Christmas I received a request from boyfriend's mom from us for Mother's Day. She wants a BIG tote bag. She currently has one that she loves and uses at the beach/on vacations, etc etc. Her request included something with exterior pockets, the one she has now has flap closures on them, as well as a zippered closure (i'm thinking recessed) and BIG. So immediately I jump online and try and see if I can come up with something, but nothing out there really has exterior pockets, and if it does, they don't have closures (doesn't need to be flaps). I like the look of the Anna Marie Horner Art Student Tote and she liked the size of option B - 24" x 17.5" x 4" -- which is why I was thinking recessed zipper. If anyone has any thoughts, patterns, ideas, etc etc. I'd REALLY appreciate it. I'm aware that i'm super early but if it comes down to me needing to devise something, i'd like to have the time for trial and error. I'm sure you've heard by now, but I wanted to bring this to your attention in case there was any way you could help out, Jess let me know about this cause.. Jess is collecting quilts or completed tops, so get together with your guilds and see what you can come up with..
"My heart goes out to all the people and families affected by the fires. What I've decided to do is ask for donations of baby's and kids quilts to pass on to the families who have lost so much in the fires. If you can help out with this, please let me know and I'll give you details of where to send them. If you have quilt tops that just need backing and quilting, I'd be happy to accept these too and quilt them up myself to give to the families who've been affected. UPDATE: There is a register being set up of children who have been affected by the fires - all the donated quilts will be matched to a recipient via the register (based on gender and age), and delivered directly to the families in need. This will be an ongoing effort, so there is not really an accurate time frame I can give." There is also a handmade auction being hosted by The Handmade Library - if you are interested in donating anything for the auction, you can find the Facebook group here. Any help you could offer would of course, be greatly appreciated! 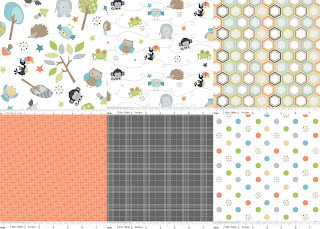 Honey, Honey by Kate Spain has arrived and yardage is available in the shop. I've also added fat quarter and fat eighth bundles. Custom bundles are always available, so don't hesitate to ask!! So, I'm not sure if its because i'm coming off the Hurricane Sandy project, or going back to work after 17 days off, or just that its ridiculously warm here (I know, I know, i'm not complaining, but its too warm) but my sewing machine has stayed VERY quiet. It helps that we brought a new friend home last week, so i've been a bit distracted.. I'm finding that i'm much rather lounge on the couch with my EPP work.. so that's what i've been doing. So, for January I think i'm going to start small and work on some of the easier things on my list. 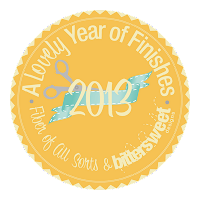 I'm still lacking my sewing mojo after the mad dash at the end of last year.. So i've been seeing this new linky pop up through blog land and I think i've finally decided to join in. I find it easier for me to stay on track when i'm forced to be held accountable, and this concept of finishing ONE ufo, or wip a month, is definitely doable. So let's see what things i'll be looking to accomplish in 2013. 3. 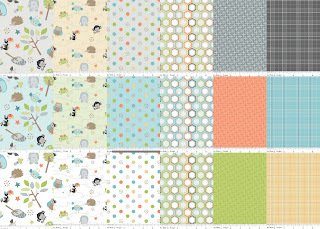 DWR quilt - 80 arcs made, taking this one slow, but 2013 is the year! 6. Heirloom quilt - i've been hoarding this fabric for some time.. no more hoarding! 7. Clothing - I want to make some clothing this year, i've already ordered the Wiksten tank to try first..
8. Sea Swirls quilt - I've been wanting to make this project since I saw Jess's version (pictured below) - I have my fabric pulled.. but thats it. 9. 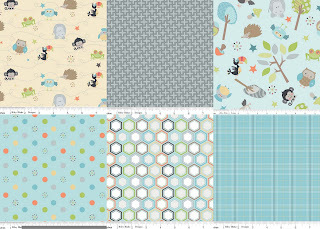 Various Patterns - I have so many patterns i've ordered/saved that I want to start working my way through them.. one a month at least! 10. Hawaiian applique - I want this finished before our possible move back to the mainland next summer. That should be enough to get me started. I have other projects that i'll be adding in monthly as the commitments arise but they arent started yet.. Here's to a productive 2013!